Of all of our treatments, our acne scar treatment is by far one or our favourites to perform. Facial scars can be so emotionally draining and being able to help is very satisfying. Our personal success rate with treatment to date has been been very satisfying with 100% of our clients seeing improvement after the first treatment. The photos on this page show improvement after only 1 DermaEraze acne scar treatment. Acne scars traditionally have been very difficult to treat. Our treatment will “plump up” the scars by stimulating the collagen in the area. The dents will become less noticeable as your body’s own healing mechanism “fills them in”. The results are truly astounding! On average we see a 30% to 50% improvement in the texture of the skin with the first treatment. People who have had acne, by the very nature of acne itself, tend to have very good skin later in life which is why, acne scars….of all scars…are one of the easiest to repair. 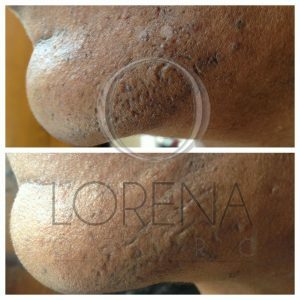 How does DermaEraze Acne Scar Treatment work? DermaEraze works by creating precision trauma on the affected area. This sends signals to the brain to attract collagen and lymphatic fluids to the treated area in order to repair the trauma – the scar is then repaired as a by-product of the trauma. DermaEraze will not magically make the scar vanish. What it will do is two-fold. It will soften and plump up the scar tissue making it less obvious AND it will induce your own body to re-pigment the scar to the colour of the rest of the skin so that it becomes nearly unnoticeable. Once the scars have been repaired any redness in the area can be treated very effectively with an IPL laser. Most people need 4 treatments 3 to 4 months apart to achieve optimum results although many are happy with one or two treatments. We can also treat Hyper-pigmentation issues which result in darker skin tones.